Create your own WordPress theme with our tutorial Create a Bare-bones WordPress Theme From Scratch. If you do work online, you absolutely need a portfolio. You can have a ton of cool fonts and all the pop-up plugins you could ever need. But if you can’t display your work to potential clients, you’re missing out. Being able to present your projects in an appealing fashion is an invaluable tool, as it can tell the reader why you’re better than everyone else at what you do. You have two options for a stunning portfolio. You can either use a portfolio theme or get a portfolio plugin. If you don’t prefer any of the portfolio themes or simply want to use a different one, then a portfolio plugin is for you. The plugins listed below are 9 of the best WordPress portfolio plugins available, they’re the cream of the crop. They’re packed with useful features and are simple to use. Several of them are free, and all of them will catch the eye of potential clients. All of these options display your work in a clean, unobtrusive fashion. The interface is intuitive and looks great with any WordPress theme. To add projects, you simply add a video slide or image and enter the details of the projects. All you have to do is paste a line of shortcode on the page of your choice, and voilà, you’ve got a shiny new portfolio. The free version has everything you need to get started and customize your portfolio. If you spring for one of the paid versions ($40-$100), you’ll get more options and a higher level of customization. Career Portfolio is a streamlined, grid-based portfolio plugin. It’s a fully responsive design that supports shortcode for easy setup. So if you like the look and want to be able to customize it more, springing for the paid version is a smart investment. Nimble Portfolio offers a straightforward gallery for showcasing your projects. It’s a user-friendly, responsive design based around a grid of frames. You have a lot of room to play around with this plugin, since you can modify almost everything. You can choose thumbnail styles, categorize projects, and embed videos or PDF previews. Its flexibility is a strong plus that makes it ideal for just about everyone. Nimble Portfolio also offers several premium add-ons, including various skins and lightbox options. It’s one of the most full-featured free portfolio plugins available. Waving Portfolio is another grid-based portfolio that uses shortcodes for customization. It’s simple to add projects, and viewers can filter from the front end using category buttons. The viewer can click on your project to see a pop-up with more detail. It’s a great option for creatives who want a no-fuss approach to their portfolio. You can choose from a light or dark skin and customize the sizes/dimensions of portfolio items. If you need a portfolio to use regularly that doesn’t require complicated maintenance, Waving Portfolio is a solid option. Another take on a clean grid-based layout, BestWebSoft’s Portfolio plugin is a free option that provides several features so you can personalize your portfolio. You can modify various elements, such as image size and labels. The result is a dynamic portfolio that nicely showcases your work. While it’s not responsive, it’s hassle-free and user-friendly. The paid version ($25) offers additional functionalities, including categorization and extended support. The free version is a good way to get started building your professional portfolio. Awesome Filterable Portfolio gives you exactly that––a unique, filterable portfolio that shows off your work in style. This plugin comes with animations and image hover effects that add some verve to your portfolio. You can easily order portfolio categories and items and configure the animation properties. It’s an intuitive option for artists or photographers who want to display their images in a striking fashion. Aeolus is the perfect portfolio plugin for contemporary creatives who want an impressive pedestal for their work. You can display your work in parallax showcase or as thumbnails in a column showcase. It’s fully responsive and comes with unlimited colors so you can tweak it to your liking. Another big plus is the drag and drop interface of the admin panel, which makes customization a breeze. For a free plugin, Aeolus has some of the best features available. If you like the parallax showcase, this is the portfolio plugin for you. If you’re a Behance user, managing your portfolio just got a whole lot easier. This nifty portfolio plugin helps you integrate Behance projects on your WordPress site and allows you to manage everything from the Behance interface. It’s a clean, minimalistic layout that’s grid-based but not clunky or unnatural. It’s responsive and swift, allowing viewers to easily navigate your portfolio. The plugin offers categorization, tab customization, custom styling, and more. It’s a wonderful plugin that’s a Behance user’s dream. 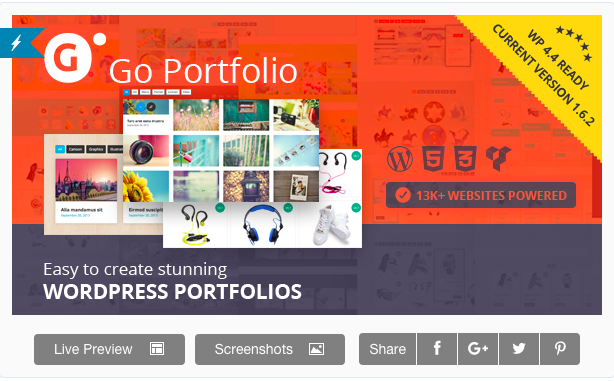 Go Portfolio offers a full set of features and design options for a mere $23. The percent based grid layout provides an appealing touch to any site. Go Portfolio comes with four default styles, Google Web Font support, customizable vertical and horizontal spaces, and a plethora of other useful features. The admin panel gives you all the options you could ask for. You can have unlimited portfolios and custom post types. You can modify anything to your heart’s content and tailor it to your needs. It’s great for companies and individuals alike, no matter your industry or niche. If you’re looking for a robust portfolio plugin that gives you options galore, then Go Portfolio is easily worth the $23. In a world where nearly every field is growing more competitive by the hour, an outstanding portfolio will make your work shine. By showcasing your work in an appealing, memorable fashion, potential employers and clients are more likely to be impressed and take note of you and your work. These portfolio plugins provide a simple way to organize your work, and you can customize all you want. Add them to the theme of your choice, and you’re good to go. After you’ve finished customizing your portfolio, you can share it with everyone, and don’t be surprised if you get more eyes on your work.